I am going to depart from the firearms topic for today to discuss everyday carry items that I have with me at all times that would also serve you well too. First is a list of items to carry everyday on your person then expanding to a list of items you should have ready in your vehicle. 1. Sidearm. I have already written about the need to concealed carry a firearm. I carry a 9 mm on my strong side in a IWB holster. I have chosen to carry the XD-9 sub-compact because of the reasons I have already listed in a previous post. 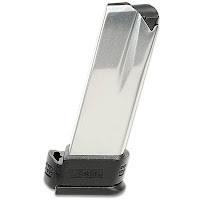 This sub-compact magazine holds 13 rounds. 2. Secondary magazine. On my weak side belt I carry a back up magazine. In both magazines are hollow point defense rounds. This ammo is made to expand uniformly and give you the best change of stopping your assailant. 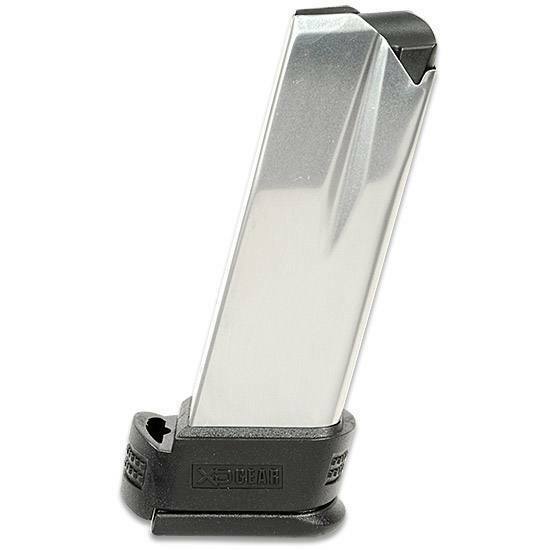 This magazine is an extended version which make the grip the same size as a full size pistol for both comfort and additional capacity. This full size magazine carries 16 rounds. 3. L.E.D. Flashlight. I prefer the Fenix brand because of reliability and quality and carry the PD20 model. It holds a single CR123 lithium battery. Being a single battery LED flashlight it is small yet powerful. At 180 lumens on high it is plenty bright for pretty much every purpose. 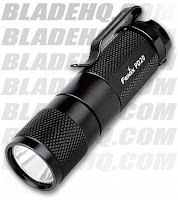 It also has a low, medium, SOS and strobe settings along with the high 180 lumens. I chose the lithium battery version because their output is typically higher than a AA and they can sit for years without losing power. This light either clips onto my left hand pocket or into its own pouch on my belt next to the secondary magazine. If you concealed carry it is important to have a light as well. Target identification when it's dark is paramount. 4. Pocket Knife. The ideal EDC knife, in my opinion, is a 3-4" blade folding knife with a pocket clip. Where you live may regulate the size of blade that you can carry (as well as to whether you can carry a concealed firearm) so be sure to check your local laws. I do not choose to carry an automatic version (your laws may prevent this anyway) but feel that it is necessary to have a knife that is easy to open and close with one hand. With everything that I carry on me weight is a concern so I typically carry the Spiderco Manix. It is a good looking, high quality knife with great features. It is lightweight, comes super sharp, has great quality steel and has a very useful shape to the blade for both defense and utility. It is very comfortable in my hand and has excellent jimping on both the spine and the choil. It has a tip down pocket clip that is adjustable for either right or left handed people. I carry this clipped in my right hand pocket and use it everyday! As you can see... 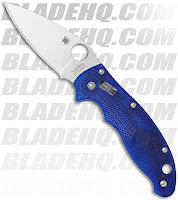 I like BladeHQ.com There are also lots of other brands that I love other than Spiderco. 5. Utility Tool. Leatherman. Multi-tool. Whatever you call it you should have one, or two. 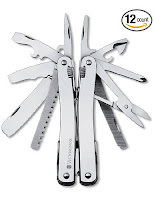 I prefer the Victorinox versions although the Leatherman and Gerber are excellent as well. 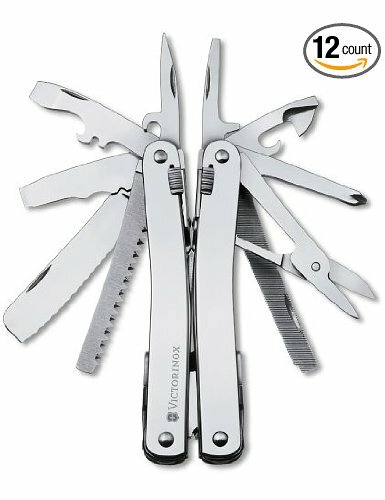 I used to carry the Swiss Champ with me everywhere before these multi-tools became popular and fell in love with the quality and feel of the Victorinox brand. This is why I like these tools best. Choose one with the features that suit your needs best. 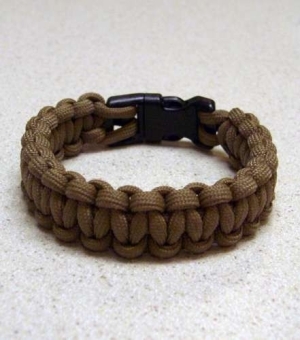 If you choose to carry it on your belt I bet you will find how useful it becomes. This is the smaller version that I carry because it is more lightweight and compact but I also own and love the larger version. There isn't a tool on either of these that I don't use regularly. 7. Cell Phone. I don't believe that I need to expound on this. 8. Pen. Remembering vital information in an emergency or recording events to document an emergency or crime is important. Handwritten notes have been known to hold up in court and can be helpful in many different ways. 9. B.U.G. Back up gun. Carried on either your ankle, weak side or appendix carry a second firearm can be used to arm another family member. Always choose a high quality holster that serves your specific purpose best. I will expound on this more in a future post. 10. Leather Belt. A quality 1-1/2" wide leather or comparable belt is what will make all of this work well. A thin flimsy belt will just be annoying and uncomfortable. 12. Back up flashlight and batteries. 15. Basic first aid kit. 28. Water bladder/collapsible water bottle. 30. Contractor grade garbage bag. 49. Comprehensive first aid kit. 51. Tire repair kit. Know how to use it. 53. 2 Liter water - min. 54. Empty 1 gal gas can. 55. Make sure your vehicle jack and spare tire are all there and in working order.